Background: Considering the increased rate of microbial resistance to antibiotics and chemical side effects of antibiotics and antiseptics used for the treatment of periodontal disease, there is a need for an alternative antimicrobial agent with fewer complications. Medicinal herbs have recently become popular as novel antimicrobial agents. This study aimed to assess the antibacterial effects of hydroalcoholic extracts of Lawsonia inermis, Malva sylvestris, and Boswellia serrata on Aggregatibacter actinomycetemcomitans. Materials and Methods: Hydroalcoholic extracts of the three medicinal plants were obtained by the maceration technique and A. actinomycetemcomitans was cultured. Antimicrobial efficacy of the three medicinal plants was compared with that of 0.2% chlorhexidine (CHX) according to the Clinical and Laboratory Standards Institute protocol using agar disc diffusion and broth microdilution techniques. All tests were repeated three times. Results: Hydroalcoholic extracts of all three plants had antimicrobial activity against A. actinomycetemcomitans. The minimum inhibitory concentration (MIC) of L. inermis, M. sylvestris, and B. serrata was 78.1, 156.2, and 1666 μg/mL with no significant difference between them. The MIC of CHX was 3.33 μg/mL, which was significantly higher than that of B. serrata extract. Conclusion: Given that further in vivo studies confirm other properties of these extracts and their safety in terms of cytotoxicity and mutagenicity, hydroalcoholic extracts of L. inermis and M. sylvestris may be used in mouthwashes or local delivery systems to affect periodontal biofilm. Periodontitis is an inflammatory disease of the supporting tooth structures caused by anaerobic, Gram-negative periopathogens, which is characterized by progressive destruction of periodontal ligament and alveolar bone and is associated with pocket formation, gingival recession, or both. It is among the most common oral health problems in human societies. Dental plaque is an organized structure of different microorganisms and plays an important role in occurrence of periodontal disease. In addition, extensive use of synthetic chemical agents and medications has numerous side effects and has resulted in emergence of uncommon infections and microbial resistance. Recently, the use of herbal medicines has gained increasing popularity due to their history of use in traditional medicine, containing various bioactive molecules, easy availability, and low cost. Moreover, the side effects of herbal medications are often insignificant, and they can be safely used. Lawsonia inermis, Malva sylvestris, and Boswellia serrata are among the commonly used herbal medications. Henna with the scientific name L. inermis is a shrub or tree from the family of Lythraceae. It often grows in tropical areas in Africa and Asia. In Iran, it is often found in Balouchestan.,,, Chemical composition of henna includes lawsone, mucilage, mannite, gallic acid, and tannic acid. The main molecule produced by this plant is lawsone, which is primarily concentrated in the leaves and comprises 0.5%–1.5% of the henna., This molecule has high capacity for bonding to proteins and confers staining properties for coloring of skin, hair, nails, leather, silk, and wool. L. inermis has antihyperglycemic, antiulcer, antihemorrhagic, and hypotensive properties as well. Roots, leaves, flowers, and seeds of this plant are used for treatment of different diseases in traditional medicine. Leaves are effective for the treatment of diarrhea, bloody diarrhea, and leprosy; flowers are effective for the treatment of anemia, insomnia, burning sensation, cardiopathy, and fever; and the seeds are effective for the treatment of intermittent fever. Furthermore, in traditional medicine, it is used for the treatment of edema, bronchitis, menstrual disorders, rheumatism, hemorrhoids, jaundice, enlarged spleen, and cutaneous diseases. Anti-inflammatory properties, anticancer properties, and antioxidant properties are among the most important characteristics of L. inermis. The antibacterial effects of L. inermis on Gram-positive bacteria such as Staphylococcus aureus and Gram-negative bacteria such as Escherichia More Details coli have been documented.,, In a previous study, subcutaneous injection of ethanolic extract of L. inermis in rats showed no toxicity in 300 mg/kg concentration. M. sylvestris is a plant from the family of Malvaceae. It commonly grows in Europe, North Africa, and South-West Asia. In Iran, it grows around Tehran, Gilan, and central and southern parts of the country such as Qeshm and Bandar Abbas.,, This plant has dark green leaves with five lobes and dentate margins and red to blue-purple flowers arranged along the axis of the leaves. Photochemical constituents of M. sylvestris include several classes of terpenoids such as monoterpenoids, diterpenoids, and aromatic compounds. It also contains mucilage, volatile essences and small amounts of tannin, malvin, and malvidin.,,, In Iran, M. sylvestris is used as a vegetable and medicinal plant. Flowers of M. sylvestris are used for the treatment of wounds, eczema, cutaneous infections, bronchitis, and gastrointestinal problems. It also has strong anti-inflammatory, antioxidant, anticancer, anticough, and laxative properties. According to Wang (2005), anthocyanin in the composition of B. serrata decreases the plasma cholesterol and total glyceride levels. They also showed that B. serrata extract protected the mice against gastric ulcers caused by ethanol, and this property can be related to the high mucilage content., Antibacterial activity of this extract against S. aureus, E. coli, and Enterococcus faecalis has been confirmed. B. serrata belongs to the family of Burseraceae, which is ethnic to Saudi Arabia, Yemen, and Somalia and is also cultivated in India. This plant has secretory canals. A groove is created in the body of the shrub in order for its white juice, which is resinous, to leak out. History of the use of B. serrata resin dates back to 3000 years ago. After exposure to air, it becomes solid and can be found in amorphous pieces, white to yellow-brown in color., Boswellic acid is the most important constituent of B. serrata resin. Evidence shows that Acetyl-11-Keto-ß-boswellic acid (AKBA) is the main constituent of resin, which is a pentacyclic terpenoid. It has a selective nonoxidative inhibitory pattern for the 5-lipooxygenase pathway, which is the main pathway for the production of leukotrienes from the arachidonic acid in cellular immunity. AKBA has significant activity against a number of inflammatory diseases such as cancer, arthritis, chronic colitis, ulcerative colitis, Crown's disease, and bronchial asthma.,,,,, New pharmacological studies have shown that in addition to anti-inflammatory effects, it regulates the immune system, inhibits the synthesis of leukotrienes, has anti-oxidant properties, and protects the liver., It also lowers the blood sugar and triglycerides and positively affects the memory. It has been used for the prevention and treatment of Alzheimer's disease. Antimicrobial activity of B. serrata against S. aureus, E. coli, and Streptococcus mutans and its antifungal activity against Candida albicans have been confirmed. Several studies have assessed the effect of medicinal plant extracts on oral pathogens and have shown the positive efficacy of extracts of plants such as B. serrata (AKBA) on A. actinomycetemcomitans, Porphyromonas gingivalis, Fusobacterium nucleatum, and Prevotella intermedia, M. sylvestris on A. actinomycetemcomitans, and L. inermis on aerobic bacteria such as S. aureus. However, it has been shown that hexane and dichloromethane in the extract of M. sylvestris and KBA in B. serrata extract have no antibacterial activity. There are also controversies regarding the effect of L. inermis on Gram-positive and Gram-negative bacteria and its minimum inhibitory concentration (MIC). Considering the possible effect of geographical location and type of solvent of extract on its antimicrobial activity and since the effects of hydroalcoholic extracts of these herbs on A. actinomycetemcomitans have not been previously evaluated, this study aimed to assess the effect of hydroalcoholic extracts of B. serrata, M. sylvestris, and L. inermis on A. actinomycetemcomitans. B. serrata was purchased from the Shirazi Bazar in Tehran, M. sylvestris dried flowers were obtained from the Medicinal Plant Research Center, and L. inermis leaves were obtained from the farms of Dezful in spring of 2016. Hydroalcoholic extracts of the plants were obtained using the maceration technique (soaking and shaking in solvent). Plants were first milled by electric mortar and then 1000 g of each plant was weighed by a digital scale. Each sample was separately placed in a 2000 mL Erlenmeyer flask, and 2000 cc of solvent (ethanol and water with 50/50 ratio) was added to it (5:1 powder/solvent ratio). Erlenmeyer flasks were capped with aluminum foils, and they were stored at room temperature for 72 h. The solutions were filtered using a Buchner funnel. After filtering, the extracts were concentrated by a rotary device and this was repeated three times for each extract. Dried concentration was weighed, labeled, and refrigerated at 4°C. For microbial assessment, 20 mg of each extract was weighed by a digital scale and dissolved in 2cc of 2% dimethyl sulfoxide using a shaker. A. actinomycetemcomitans standard anaerobic Gram-negative bacteria (JP2 Nov99) were used in this study. Standard strains of A. actinomycetemcomitans were obtained in vials from the cellular and molecular laboratory of dental school, and the vials were broken under aseptic conditions. Their contents were poured into tubes containing tryptic soy agar. The tubes were then placed in an anaerobic jar and incubated at 37°C for 24 h (type A GasPak, Merck). The bacteria were then passaged on chocolate agar medium and incubated again under the same conditions mentioned earlier. Plates containing tryptic soy broth were prepared by dissolving 40 g of medium in 100 mL of distilled water and addition of 10% sheep blood. To assess the antimicrobial activity of extracts, according to the CLSI protocol, four concentrations of 12.5, 25, 50, and 100 μL were prepared. Four plates were swab cultured with 0.5 McFarland standard concentrations of bacteria next to the flame. For the well-plate test, seven wells were created in each plate with 8-mm diameter using a sterile Pasteur pipette. Four wells were assigned to different concentrations of extracts, one well was for 0.2% CHX, one well was for doxycycline (Padtan Teb), and the last well was for the dimethyl sulfoxide negative control group. For the disc diffusion method, 6-mm blank paper discs (Bahar Afshan, Iran) were soaked in different concentrations of extracts and the positive and negative control groups, and after drying, they were placed in plates. After preparation, all plates were placed in anaerobic jar (type A GasPak, Merck) and incubated at 37°C for 48 h. Next, the plates were removed from the jar and the diameter of growth inhibition zone (if present) was measured by a ruler with 0.01-mm accuracy. The results were reported as means. All tests were repeated in triplicate. For this test, a row with eight wells in a 96-well microplate was assigned to diluted concentrations of each extract. For each extract, first 100 μL of Mueller-Hinton broth was added to each well, and then, 100 μL of the extract was added to the first well. Using a sampler, dilution was continued to the 8th well. Next, 10 μL of 1/20th suspension with 0.5 McFarland standard concentration was added to each well. CHX and doxycycline were used as positive controls. After placement in an anaerobic jar and incubation at 37°C for 24 h, contents of all wells were cultured on blood agar to determine MIC and minimum bactericidal concentration (MBC). The lowest concentration of extracts inhibiting bacterial growth was recorded as MIC and the lowest concentration of extracts causing death of bacteria was recorded as MBC. All tests were repeated in triplicate. Based on the results of disc diffusion method, growth inhibition zone was only noted around hydroalcoholic extract of B. serrata. In the well-plate method, none of the extracts showed antimicrobial activity against A. actinomycetemcomitans except for the control group [Table 1]. Hydroalcoholic extract of B. serrata with 100 μL concentration showed the highest antimicrobial activity against A. actinomycetemcomitans but had no significant difference with CHX and doxycycline (P > 0.05) [Figure 1]. [Table 2] shows the MIC and MBC of hydroalcoholic extracts of L. inermis, M. sylvestris, and B. serrata against A. actinomycetemcomitans. In broth microdilution method, all extracts showed antimicrobial activity against A. actinomycetemcomitans. The highest antimicrobial activity belonged to the hydroalcoholic extract of B. serrata (MIC of 78 μg/mL) and the lowest antimicrobial activity belonged to the hydroalcoholic extract of M. sylvestris (MIC of 1666 μg/mL), which had a significant difference with CHX and doxycycline (P < 0.05). This study showed the strong antibacterial effect of hydroalcoholic extract of B. serrata on A. actinomycetemcomitans using broth microdilution method. In this study, hydroalcoholic extracts of L. inermis and M. sylvestris showed weaker antimicrobial activity than that of B. serrata, respectively, and MIC of M. sylvestris was significantly lower than that of CHX. The positive antibacterial effect of hydroalcoholic extract of B. serrata on A. actinomycetemcomitans in broth microdilution method and also the direct correlation with concentration of B. serrata extract and diameter of growth inhibition zone in disc diffusion method in our study were in agreement with the results of Kafshdar Goharian who assessed the antibacterial effect of organic extract of B. serrata on A. actinomycetemcomitans. However, the MIC reported in their study was 780 μg/mL, which was higher than the MIC in our study (78.1 μg/mL). It means that the hydroalcoholic extract of B. serrata has a stronger antimicrobial activity than its organic extract, which may be due to the type of solvent, season of collection of plant samples, and tested concentrations in broth microdilution method. No other study was found on the effect of B. serrata extract on A. actinomycetemcomitans. However, some studies have assessed the effect of B. serrata on other anaerobic Gram-negative periopathogens of the oral cavity. For instance, Raja et al. purified B. serrata and assessed the effect of its constituents on P. gingivalis, P. intermedia, and F. nucleatum. The MIC of AKBA in B. serrata for the aforementioned bacteria was 32, 4, and 128 μg/mL, respectively. They reported AKBA to be the most effective antimicrobial constituent of B. serrata. Weckesser et al., in Germany, reported that alcoholic extract of B. serrata had no effect on F. nucleatum and P. intermedia, and the MIC of extract for P. gingivalis was 1 μg/mL. Difference in the results of the two studies may to some extent indicate the positive effect of purification of extract for increasing its antimicrobial activity. In the current study, hydroalcoholic extract of B. serrata had growth inhibition property in disc diffusion test while agar well-diffusion method did not show such property. Valgas et al. showed that the well-plate method was superior to the disc diffusion because the free hydroxyl groups in the discs may prevent the diffusion of cationic molecules of the extract. However, this result was not in accordance with ours, which may be due to the better superficial diffusion of extract from the disc into the agar compared to the well-plate method. Antimicrobial effect of M. sylvestris has only been evaluated against a few microorganisms. According to Benso et al., methanolic and chloroformic extracts of M. sylvestris have antimicrobial activity against A. actinomycetemcomitans and other anaerobic periopathogens, namely, F. nucleatum, P. gingivalis, and P. intermedia. Lower MIC reported in their study compared to ours may be due to different methodology, part of plant used, and type of extract. No other study was found on the effect of M. sylvestris extract on A. actinomycetemcomitans. However, Razavi et al. showed that methanolic extracts of the flower and leaves of M. sylvestris had high antimicrobial activity against S. aureus, Streptococcus agalactiae, and E. faecalis. Lower MIC reported in their study compared to ours may be due to the difference in type of extract, parts of the plant used, and more importantly, type of bacteria. In the current study, M. sylvestris and L. inermis extracts showed antimicrobial activity only in broth microdilution method, and agar disc diffusion test did not show any growth inhibition zone. The reason may be that we did not isolate the constituents of the extracts. Thus, in comparison with antibiotics, the presence of agar in the medium may inhibit the diffusion of extract and thus, no or weak antimicrobial activity was observed in agar disc diffusion test. However, in broth microdilution method, the inhibitory effect of agar is not present, and the extracts are in contact with bacteria in a liquid environment; thus, they can easily show their bactericidal or bacteriostatic properties. Lin compared the antimicrobial properties of chitosan using different methods and showed that broth microdilution yielded better results than the disc diffusion method. They concluded that broth microdilution is a suitable and fast screening method compared to other techniques, and their results were somehow in line with ours. Moreover, considering the presence of saliva and gingival crevicular fluid in the oral environment, broth microdilution can better simulate the oral cavity than agar disc diffusion test and can yield more reliable results. In general, difference in the results of studies comparing medicinal herbs may be due to the use of different parts of the plant, geographical location, weather conditions, time of harvesting, and method of obtaining the extract and its purification. Significant difference in antimicrobial efficacy of plant extracts and CHX may be due to the cationic nature of CHX, enabling it to adhere to all surfaces with a negative charge, and release at a specific time point. Thus, direct comparison of CHX with medicinal plant extracts may not be logical. Previous studies have provided evidence regarding leukotoxicity of JP2 genotype of A. actinomycetemcomitans and its association with local aggressive periodontitis. Considering the positive antibacterial effects of hydroalcoholic extracts of L. inermis and B. serrata on A. actinomycetemcomitans, further studies are required to isolate the effective constituents of these extracts for the treatment of periodontal disease. 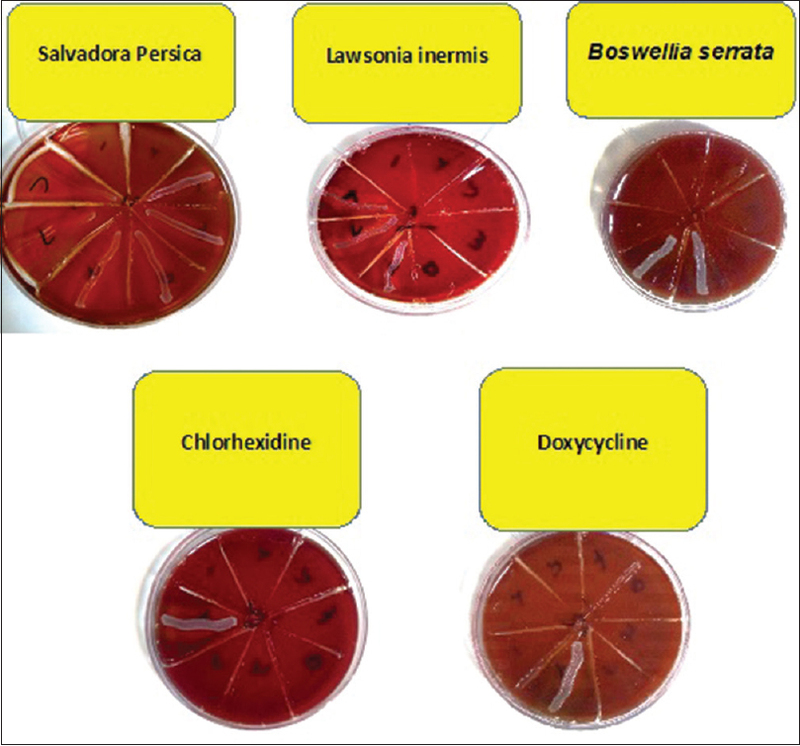 Due to the unavailability of other anaerobic periopathogens such as P. gingivalis, F. nucleatum, and P. intermedia and lack of experience for culturing these strains, they were not evaluated in this study, and this was a limitation of our study. Further, in vitro studies are required to assess the efficacy of effective constituents of extracts on artificial dental biofilm. Furthermore, cytotoxicity and mutagenicity tests need to be performed. Eventually, mouth rinses or liquids for topical application must be prepared using these extracts and tested in vivo. Hydroalcoholic extracts of B. serrata and L. inermis may be suitable alternatives for chemical antiseptics for the treatment of periodontal disease. Future studies can further elucidate the efficacy of these extracts as mouthwash or local delivery systems for the elimination of periodontal biofilm. The authors would like to thank Research Deputy of School of Dentistry, Shahid Beheshti University of Medical Sciences, for their kind financial support of this project. Research Deputy of school of Dentistry, Shahid Beheshti University of Medical Sciences. Takei NC. Carranza's Clinical Periodontology. California: Julie Ed; 2015. p. 9, 49-51, 81-4, 161. Marsh PD. Microbiological aspects of the chemical control of plaque and gingivitis. J Dent Res 1992;71:1431-8. Hedayati A, Khosropanah H, Bazargani A, Abed M, Emami A. Assessing the antimicrobial effect of the essential oil of Myrtus communis on the clinical isolates of Porphyromonas gingivalis: An in vitro study. Jundishapur J Nat Pharm Prod 2013;8:165-8.
. Kranti K, Seshan H, Zope S. Clinical evaluation of topical subgingival application of biodegradable xanthan based 1.5% Chlorhexidine gel for treatment of periodontal pockets. J Adv Dent Res 2010;1:47-54. Slots J, Feik D, Rams TE. Prevalence and antimicrobial susceptibility of Enterobacteriaceae, Pseudomonadaceae and Acinetobacter in human periodontitis. Oral Microbiol Immunol 1990;5:149-54. Van Winkelhoff AJ, Herrera D, Winkel EG, Dellemijn-Kippuw N, Vandenbroucke-Grauls CM, Sanz M, et al. Antibiotic resistance in the subgingival microflora in patients with adult periodontitis. A comparative survey between spain and the Netherlands. Ned Tijdschr Tandheelkd 1999;106:290-4. Lindhe JT, Nicklaus P. Clinical Periodontology and Implant Dentistry. 5th ed. Munksgaard Copenhagen: Willey Blackwell; 2008. p. 106-16. Ciancio SG. Chemical agents: Plaque control, calculus reduction and treatment of dentinal hypersensitivity. Periodontol 2000 1995;8:75-86. Almas K. The effect of Salvadora persica extract (miswak) and chlorhexidine gluconate on human dentin: A SEM study. J Contemp Dent Pract 2002;3:27-35. Sudharameshwari K, Radhika J. Antibacterial screening of aegle marmelos, Lawsonia inermis and Albizzia libbeck. Afr J Tradit Complement Altern Med 2006;4:199-204. Jeyaseelan EC, Jenothiny S, Pathmanathan MK, Jeyadevan JP. Antibacterial activity of sequentially extracted organic solvent extracts of fruits, flowers and leaves of Lawsonia inermis L. from Jaffna. Asian Pac J Trop Biomed 2012;2:798-802. Hemem S. Activity of Some Plant Extracts Against Common Pathogens in Bacterial Skin Infection: Thesis MSc, College of Education, Basra University, Iraq; 2002. Habbal OA, Al-Jabri AA, El-Hag AH, Al-Mahrooqi ZH, Al-Hashmi NA.In vitro antimicrobial activity of Lawsonia inermis linn (henna). A pilot study on the Omani Henna. Saudi Med J 2005;26:69-72. Imami A, Ahi A. Medical Botany. Mashhad: Mashhad University of Medical Sciences; 2015. Al-Rubiay KK, Jaber NN, Al-Mhaawe BH, Alrubaiy LK. Antimicrobial efficacy of henna extracts. Oman Med J 2008;23:253-6. Kelmanson JE, Jäger AK, van Staden J. Zulu medicinal plants with antibacterial activity. J Ethnopharmacol 2000;69:241-6. Singh M, Jindal S, Kavia Z, Jangid B, Khem C. Traditional methods of cultivation and processing of henna. Henna, Cultivation, Improvement and Trade. Jodhpur: Central Arid Zone Research Institute, 2005, 21–24. Choubey A, Ojha M, Mishra A, Mishra S, Patil U. Hypoglycemic and antihyperglycemic effect of ethanolic extract of whole plant of Lawsonia inermis (henna) in streptozotocin induced diabetic rats. Int J Pharm Sci Rev Res 2010;1:74-7. Goswami M, Kulshreshtha M, Rao C, Yadav S, Yadav S. Anti ulcer potential of Lawsonia inermis leaf. Int J Pharm Sci Rev Res 2011;10:25-7. Rahmoun M, Benabdallah M, Villemin D, Boucherit K, Mostefa-Kara B, Ziani-Cherif C, et al. Antimicrobial screening of the Algerian Lawsonia inermis (henna). Pharm Chem 2010;2:320-6. Deshpande D. A Hand Book of Herbal Remedies. India: Agrobios; 2008. p. 287-9. Singh S, Shrivastava N, Modi N, Saifi A. Anti-inflammatory activity of Lawsonia inermis. Curr Sci 1982;51: 470-471. Kamal M, Jawaid T. Pharmacological activities of Lawsonia inermis Linn. : A review. Int J Biomed Res 2010;1:37-43. Akter A, Neela FA, Khan MS, Islam MS, Alam MF. Screening of ethanol, petroleum ether and chloroform extracts of medicinal plants, Lawsonia inermis L. and Mimosa pudica L. for antibacterial activity. Indian J Pharm Sci 2010;72:388-92. Gull I, Sohail M, Aslam MS, Amin Athar M. Phytochemical, toxicological and antimicrobial evaluation of lawsonia inermis extracts against clinical isolates of pathogenic bacteria. Ann Clin Microbiol Antimicrob 2013;12:36. Gasparetto JC, Martins CA, Hayashi SS, Otuky MF, Pontarolo R. Ethnobotanical and scientific aspects of Malva sylvestris L.: A millennial herbal medicine. J Pharm Pharmacol 2012;64:172-89. Cutillo F, D'Abrosca B, Dellagreca M, Fiorentino A, Zarrelli A. Terpenoids and phenol derivatives from Malva silvestris. Phytochemistry 2006;67:481-5. Barros L, Carvalho AM, Ferreira IC. Leaves, flowers, immature fruits and leafy flowered stems of Malva sylvestris: A comparative study of the nutraceutical potential and composition. Food Chem Toxicol 2010;48:1466-72. Veshkurova O, Golubenko Z, Pshenichnov E, Arzanova I, Uzbekov V, Sultanova E, et al. Malvone A, a phytoalexin found in Malva sylvestris (family malvaceae). Phytochemistry 2006;67:2376-9. Razavi SM, Zarrini G, Molavi G, Ghasemi G. Bioactivity of Malva sylvestris L. a medicinal plant from Iran. Iran J Basic Med Sci 2011;14:574-9. Gürbüz I, Ozkan AM, Yesilada E, Kutsal O. Anti-ulcerogenic activity of some plants used in folk medicine of Pinarbasi (Kayseri, Turkey). J Ethnopharmacol 2005;101:313-8. Shen T, Lou HX. Bioactive constituents of myrrh and frankincense, two simultaneously prescribed gum resins in Chinese traditional medicine. Chem Biodivers 2008;5:540-53. Yauan G, Wahlqvist M, He G, Yang M, Li D. Natural products and anti-inflammatory activity. Asia Pac J Clin Nutr 2006;15:143. Raja AF, Ali F, Khan IA, Shawl AS, Arora DS, Shah BA. et al. Antistaphylococcal and biofilm inhibitory activities of acetyl-11-keto-β-boswellic acid from Boswellia serrata. BMC Microbiol 2011;11:54. Safayhi H, Rall B, Sailer ER, Ammon HP. Inhibition by boswellic acids of human leukocyte elastase. J Pharmacol Exp Ther 1997;281:460-3. Safayhi H, Mack T, Sabieraj J, Anazodo MI, Subramanian LR, Ammon HP, et al. Boswellic acids: Novel, specific, nonredox inhibitors of 5-lipoxygenase. J Pharmacol Exp Ther 1992;261:1143-6. Singh S, Khajuria A, Taneja SC, Khajuria RK, Singh J, Johri RK, et al. The gastric ulcer protective effect of boswellic acids, a leukotriene inhibitor from Boswellia serrata, in rats. Phytomedicine 2008;15:408-15. Etzel R. Use of Incense in the Treatment of Alzheimer's Disease. Google Patents; 1998. Tsukada T, Nakashima K, Shirakawa S. Arachidonate 5-lipoxygenase inhibitors show potent antiproliferative effects on human leukemia cell lines. Biochem Biophys Res Commun 1986;140:832-6. Huang MT, Badmaev V, Ding Y, Liu Y, Xie JG, Ho CT, et al. Anti-tumor and anti-carcinogenic activities of triterpenoid, beta-boswellic acid. Biofactors 2000;13:225-30. Krieglstein CF, Anthoni C, Rijcken EJ, Laukötter M, Spiegel HU, Boden SE, et al. Acetyl-11-keto-beta-boswellic acid, a constituent of a herbal medicine from Boswellia serrata resin, attenuates experimental ileitis. Int J Colorectal Dis 2001;16:88-95. Ravanan P, Singh SK, Rao GS, Kondaiah P. Growth inhibitory, apoptotic and anti-inflammatory activities displayed by a novel modified triterpenoid, cyano enone of methyl boswellates. J Biosci 2011;36:297-307. Flavin DF. A lipoxygenase inhibitor in breast cancer brain metastases. J Neurooncol 2007;82:91-3. Ammon HP, Mack T, Singh GB, Safayhi H. Inhibition of leukotriene B4 formation in rat peritoneal neutrophils by an ethanolic extract of the gum resin exudate of Boswellia serrata. Planta Med 1991;57:203-7. Raja AF, Ali F, Khan IA, Shawl AS, Arora DS. Acetyl-11-keto-β-boswellic acid (AKBA); targeting oral cavity pathogens. BMC Res Notes 2011;4:406. Benso B, Rosalen PL, Alencar SM, Murata RM. Malva sylvestris inhibits inflammatory response in oral human cells. An in vitro infection model. PLoS One 2015;10:e0140331. Kafshdar Goharian M. Evaluation the Antibacterial Effect of Organic Solution of Olibanum on Aggregabacter actinomycetemcomitans (in vitro study). Shahid Beheshti University; 2014. Weckesser S, Engel K, Simon-Haarhaus B, Wittmer A, Pelz K, Schempp CM, et al. Screening of plant extracts for antimicrobial activity against bacteria and yeasts with dermatological relevance. Phytomedicine 2007;14:508-16. Valgas C, Souza SM, Smânia EF, Smânia A Jr. Screening methods to determine antibacterial activity of natural products. Braz J Microbiol 2007;38:369-80. Papageorgiou VP, Assimopoulou AN, Couladouros EA, Hepworth D, Nicolaou KC. The chemistry and biology of alkannin, shikonin, and related naphthazarin natural products. Angew Chem Int Ed Engl 1999;38:270-301. Bhuvaneswari K, Poongothai SG, Kuruvilla A, Raju BA. Inhibitory concentrations of Lawsonia innermis dry powder for urinary pathogens. Indian J Pharmacol 2002;34:260-3. Hussain T, Arshad M, Khan S, Sattar H, Qureshi MS.In vitro screening of methanol plant extracts for their antibacterial activity. Pak J Bot 2011;43:531-8. Lin J. Comparision of disk diffusion ad, and broth microdilution for antimicrobial susceptibility testing of five chitosans. A Thesis Submitted to the Department of Food and Science, Graduate Faculty of the Louisiana State University and Agricultural and Mechanical College; 2011.